Coldplay’s haunting classic The Scientist is performed by country music legend Willie Nelson for the soundtrack of the short film entitled, Back to the Start. What Makes a Food Local? I’m glad you mentioned that the local food movement has created a new space in the community that fosters a sense of shared identity and enjoyment. I’ve been wanting to eat healthier lately, so I’ve been looking for ways to make it more fun and less like a diet. I love the idea of being part of a local food community, so I think I’ll start looking around for some local food markets! I liked the article all except for one aspect. The economic side. If we all switched to locally grown foods, it would be so much more expensive than globally grown food. And with growing poverty in America, that’s not something we need right now. Here in northern Nevada we are part of a Backyard Farmers Association – the goal is to have 1,000 households growing as much of their own food as possible. There is no organization per se – one member just has an email list and then people volunteer to host events. We do tours of each other’s gardens (including livestock such as chickens), do a seed swap in the spring, and get together socially during the long winter months. Our local organic farm has workshops on different things, and one local nursery offers free talks about things such as drip irrigation systems, composting, maintaining fruit trees, hoop houses, etc. All of us seem to have the idea that it is important for us to learn what grows well in our gardens – since we are located around 4500 feet, we have a much shorter growing season than people living at lower elevations in California a mere 60 miles away on the other side of the Sierra Nevada mountains. Our city is dependent on many foods being brought in from other states – although we do have farmer’s markets, the growers are usually from further than 50 miles away – not exactly what I would consider “local” (one gallon of fuel puts 22 lbs of carbon into the air…). We are close to vast public lands so some people have trouble with rabbits, squirrels, and deer. Other common pests include quail/birds and ear wigs. This means protecting seedlings and full grown plants with row covers or with plastic or wire netting. Sharing our experiences is very helpful. I really like the way people are becoming more involved in the local food movement. I know that my family and I were going to be more involved in it, but the storms did a really bad number on what we were growing. I have a few crops that will survive, but I am not nearly as optimistic about them as I was. I think this is going to cause a significant increase in prices and for some, it will be an excuse to increase prices even if they were not hit by the storms. The only other issue around here is finding some variety. I mean, no family wants to eat the same foods all the time. We all enjoy variety and mixing things up. So, in our case, we just travel to other local markets outside of our own area. I don’t think this defeats the purpose of the local market either. It gives us a chance to travel a bit and meet new people all while promoting the local industries. So far we just take our family, but we have actually had some friends express interest in going as well. This could very well turn into a regular thing. And if we go far enough away from home, we can bring our own produce to give them some variety. I must admit to not really knowing much about the local food movement before reading this article. However, the title piqued my interest and drew me in. I suppose I thought that something called the local food movement would be focused more on maybe helping to support local growers and farmers and trying to help ensure the economic success of your local community. This sort of appealed to me, especially considering today all the pressures that farmers have in order to make a go of things. The article does make the point that this is certainly one way to consider or think about the local food movement. However, it might make things even clearer to consider this as concentric rings of a circle. The very center of this local food movement would be food that you grow at home or produce yourself. Then, the next ring would be foods that were grown or produced within your community. Moving out from there would be food produced within your county, region or state and finally those produced in surrounding states. One of the more interesting ideas that I have recently been exposed to is the local food movement. This is basically a trend that began back in the 1970’s of trying to help support more local farmers and food producers, rather than buying imported and mass commercial food processors and producers. The author of this piece does a really good job of exploring many of the implications of this movement. One of the interesting things is that in many cases, buying local food is more expensive. The example given is that land and workers (and other resources) is much cheaper in Costa Rica than in Hawaii, so imported pineapples are cheaper than Hawaiian grow fruit. However, there are a number of additional implications that offset this. One example is that much of the commercially mass produced imported food uses artificial flavors and sweeteners. This has been one of the primary factors leading to obesity in the past few decades. The article also implies that as the local and small farmers have been pushed out of business, larger commercial growers have implemented environmentally dangerous practices. Local food is very important to me and I try to buy locally as much as possible. The hard part though is that many local produce stands get their produce from farmers in different states. This makes it hard to find truly local food. That’s why I love farmers that offer the chance to pick your own produce. There is a local farm that allows you to pick your own strawberries, which not only ensures that you’re getting local produce, but also ensures you get the best berries. I love the fact that more and more local restaurants are working hard to serve dishes made with local ingredients. Some restaurants in the area change their menu frequently to take advantage of seasonal produce. Even their desserts are made with seasonal ingredients in mind. It’s a shame that many places charge more to buy local food, but it’s well worth the price. Being able to buy produce that ripened on the vine is priceless. If you don’t believe it, just compare the flavor of tomatoes that were shipped in to your grocery store and tomatoes that were locally grown. You’ll never skimp on your produce again. Best of all though, you’ll also have less waste. I am so happy to see that more people are getting on board with the local food movement. History is repeating itself, as it always does. This turn just seems like it should have been obvious years ago. I have no idea why it has taken so long. Maybe it is because the idea of having something that would seem exotic because you can not find certain foods in your area. It seems that we are all so focused on wanting more and wanting better, that we never seem to realize that we have all that we need in our own area. My area is kind of odd about it. More people are getting into the local food movement, but to some extent, the larger farmers do not seem to want it to happen. I am sure this is because they are afraid to lose some of the own exporting if people are all going to buy local. But, since corn is a major crop here, I do not think they really have much to worry about. As for me, I have taken to buying more than just local food. I try to buy everything locally if I can. If we do not support our small farmers and small businesses, the world is just going to get tougher in ways I don’t want to think about. I can not possibly be the only person who loves it when there is a movie and people are just strolling through those outdoor markets picking up fruits and vegetables and in some cases (places) even fish. That just looks like such a wonderful atmosphere to be in. I know that some of the farmers from my area go and take their food to Chicago to sell. I don’t know that they consider it local up there but it is probably about as close as they are likely to get unless they are growing plants on their rooftops. I don’t know why this did not happen sooner. After all, that is how it was done years ago when people could not travel long distances in a short enough time span to keep the food fresh. Local markets used to be the only market people went to and it wasn’t just for the food. That was a social time for them too. For people like me, it still is. There is more to local food markets than buying food. How many times have you gone to grocery store and had someone to ask about how to store your food or even how to cook it? The local food movement offers that and more. It is interesting that there are so many different concepts of the term “local”. Personally I am so tired of the idea of ever flying in foods from another country that I would be happy to buy food and call it local if it was raised here in the United States. I simply don’t understand why we go to such lengths to purchase foods from overseas when we have everything we need right here. It also means that more chemicals are added to prevent decay during the shipping process. No thank you. I am trying to raise an organic garden. People are fighting me every step of the way. It seems like they actually prefer chemicals in their food and would rather drive 20 miles out of the way to get food that was chemically treated and shipped in from who knows where. And yet, local farmers are selling their produce on every road. Some of them do use chemicals, but some are leaning toward organic methods. I don’t want to eat chemicals, but if I must then I would rather give the money to a local farmer than to a big chain store that doesn’t even consider buying local products. Locally Grown NYC gathers information from all greenmarkets in Manhattan and distributes the information via the internet, local fliers and signs, word-of-mouth campaigns, and other local advertisement. Minimizing the need for transportation and food preservation is part of the appeal of farmers markets, because it allows fresh produce to get to local New York residents with a minimal carbon footprint, and Locally Grown NYC aims to ensure that everyone is educated about the benefits of eating locally. The organization also aims to cut through the stigma that many people have against eating food that was either grown within New York City or the nearby Hudson Valley, which is erroneously considered to be very polluted. The largest market in the City that Locally Grown NYC helps operate is the market at Union Square, which is huge, at about ten blocks long. This market is more expensive than other greenmarkets, but offers almost any local food item you can think of, including duck, honey, tea, vegetable produce, orchard fruit, potatoes, seafood, fish, and even fresh ice cream from Ronybrook Farms. Nearly all of the offerings here were deemed to be ‘actually local’, with the vast majority of farms located within New York state and all of them located within two-hundred miles of Union Square. The Union Square Greenmarket is open Monday, Wednesday, Friday, and Saturday year-round, from 8 a.m. to 6 p.m.
Hudson Valley Foodscape offers a new twist on selling locally grown food in New York City by selling pre-paid farm shares. Farm shares have gained traction in recent times because they help farmers in several ways: Each farmer knows exactly how many shares to divide the harvest into, which will save on packing and transport costs, plus the farmers themselves can set the terms of sales. Farmers also are guaranteed sales, which is helpful for planning the harvest each season and provides incentive for them to make the journey to New York City locales where they can sell farm shares as well as extra harvest in a spontaneous farmers market. How a farm share works is that each farmer charges a fee for a portion of the farm’s harvests each week for eight, ten, or twelve weeks. Many farmers participate, and the charge from each participant of all weeks is added up. Residents wishing to purchase a farm share then pay a lump sum in advance that is divided up among the farmers. Then, based on the number of shares purchased, the member farms divide up that week’s harvest into equal parts. For example, if four people purchased a share, the farmer would divide the week’s harvest into quarters, while if four hundred people purchased shares, the harvest would be divided into four hundred equal parts. Thus, residents will also have an interest in farmers having a better harvest, since it means more farm goodies delivered each week. More farm shares sold may seem like a bad thing because each person will receive less per share, but in fact it is a good thing. 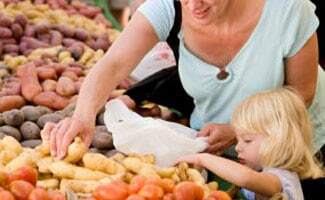 Buying food locally is the best way to buy fresh and keep your money circulating in the local community. For residents of the Big Apple, finding a market that sells locally grown food might seem like a challenge. But with the surrounding lushness of the Hudson Valley, local farms in the area are actually quite plentiful, and markets selling locally grown food products are many. I know in the New York area, so many families that would love to get their hands on some locally grown, organic food and produce. After reading this article, I knew that there had to be some good vendors in the area. Local Harvest is an organic food community made up of local farmers. The community operates local stores, markets, restaurants, and co-operatives across the nation, where local members can sell farm-fresh products of all types. The Grand Army Plaza Greenmarket, in Brooklyn, is a Local Harvest flagship store, located near the entrance of Prospect Park. The market takes place every Saturday year-round and it is free to browse goods and participate in Greenmarket events. Farmers at the Grand Army Plaza Greenmarket offer locally grown food that is certified organic, from produce, farm-fresh eggs, herbs, honey, meats, shellfish, dairy, seeds, soaps, syrup, and more. 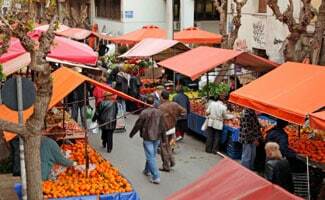 Market hours are from 8 a.m. to 4 p.m. I think that it is important that the author takes the time to list a number of the damaging side effects. This includes the rise in the number of people with diabetes and obesity. It is also a known fact that obesity results in a number of other conditions which are certainly not conducive to a healthy life. For example, high blood pressure, coronary heart disease, thyroid disease and even joint replacements are all related to an increase in how fat we have become as a nation. There are also a number of environmental and social implications. The long and short of things is that we really need a return to the local food movement right now. It may just be the only way out of this mess we have created for ourselves. Not that there is really anything wrong with the profit motive, but here’s where I stand. It seems like whoever designed these policies was getting exceptionally bad economic advice. One can only wonder if the ultimate goal was the reshaping of the farming industry and causing dramatic, ultimately negative results upon the diet of many ordinary Americans. Since corn and soy were not only very cheap and easy to produce, but also incredibly versatile, many new food items were created. This led to a huge increase in the number of processed foods (what many would call junk) and overly sweetened beverages. This is also one of the main reasons for the rapid increase in the numbers of Americans with diabetes, heart conditions and obesity since these policies were put into effect. The author also makes the interesting point that globalization played a hugely important role in this transformation of our diets as well. Now, it seemed we could get any type of food we wanted, no matter if it was in season locally. We could buy fresh strawberries imported from one section of the globe while we were still in the middle of winter. Not only could we buy apples any time of the year, we had a plethora of choices about which type of apples to buy, from granny smith to red delicious. At the same time we were having our sweet tooth activated, we had an almost unlimited number of choices available. This certainly did not help us control ourselves. Of course, we were just enjoy ourselves and the new found possibilities. We never even thought what possible consequences lay down the road. Now, some years later, it is very clear to see where all of this has taken us. The economic destruction of a large part of our farming industry, widespread obesity, disease and a health care epidemic. Not to mention political chaos and faltering social structures. The author also correctly points out the strange reality now that in many cases it is cheaper to buy Costa Rican pineapples than it is to buy USA grown pineapples (from Hawaii), or any number of other foods. Having said that, slowly but surely the people are waking up to the fact that we are in a mess health wise and getting back to some good old fashioned local food could be just the solution. This article really started to get me thinking about a topic that I had never really considered before. The words local food kind of rolls off the tongue easily, but what does it really mean? Better yet, what are all of the ramifications and implications of this new or revisited movement? The word local can mean different things to different people. Local food could be food that you grow yourself, or food which your neighbor grows or produces. In fact, the author states that a good way to think about local food is as a series of concentric circles all flowing out from a core area. After food which you (or an immediately family member or neighbor) have grown, then think of food which has been grown in your local community or town, then in your county, then in your state or region, then in the next several states. Finally, you could even see food produced within your entire country as local food. As I was growing up I remember seeing the hippies selling their vegetables at the local farmer markets, which is something the author seems keenly aware of as well. This was the start of the local food movement a number of years ago. However, things are very different today and much more complicated. I found it fascinating reading through the account of how the local food movement actually began. The author seems to really know the facts and it was a pleasure to be able to read without having to wonder whether there was an agenda being pushed one way or another through the use of faulty or circuitous reasoning. Happy to report, none of that is going on here! What happened was that there was a tremendous shift in the federal farm and food policies starting in 1970 or so. The huge number of subsidies which were paid to almost all farmers were severely cut. Instead, the government decided to focus on supporting only a few types of crops, including corn and soy. This led to a number of interesting side effects. Many farmers who did not produce these crops found it very difficult to compete. Since they were no longer receiving subsidies, there costs were higher than those farmers producing the supported crops. This led to a huge number of farmers giving up, selling their land and going out of business. This has also led to a tremendous consolidation within the farming industry. Before the events, there were a large number of smaller family type farms. Now, many of those farms have been bought up by huge conglomerates, which are just focused on churning out whatever is most profitable. Great article on the local food movement River! My family and I are trying to get more involved locally here with the local food movement (no pun intended ;0), but are finding co-ops to be quite expensive. Do you know of any way to get produce on a regular basis that doesn’t cost as much? You don’t necessarily need to join a coop. You can also simply go to a local farmer’s market. Fortunately, we’re seeing more and more farmers’ markets appear and help bring communities together around the local food movement. If you’re set on joining a coop, look to have some friends or neighbors go in on an order with you, so you can split the cost amongst multiple people.